Esta entrada ha estado macerando en el disco duro durante un buen tiempo. Cubre un tema que no me gusta y que me convierte, a mis tiernos ojos, en algo que tampoco me gusta: un censurador. La excusa, nosotros contra ellos. Hace unas semanas me di de alta en una empresa de alquiler de coches joven, moderna y dinámica. La idea es estupenda. Sobre el papel. Como siempre, es la implementación la que importa. Concretamente, la implementación del proceso de reserva. Para empezar reconozco que no soy el público objetivo de este servicio: no tengo coche y no se ni quiero saber de coches. La primera experiencia, añadir mi número de tarjeta de crédito ya fue sospechosa: encontrarte en mitad del proceso con páginas en aleman no es algo que inspire confianza. Que te hagan un cargo sin avisar previamente tampoco. O tal vez sí avisan, pero es que el alemán no es lo mío. El problema serio llegó a la hora de hacer la primera reserva. Entro en la página y selecciono el modelo de Reserva Básica. Es una empresa moderna, hay tres formas de hacer una reserva. Cada proceso completamente distinto del otro y con sus propios WTF. Lo que podría entenderse como testing A/B¿/C?, pero mal hecho. Me pregunto, de hecho, si realmente analizan los resultados de esta especie de test. Así que estoy en una pantalla básica, para un usuario básico. Pero este usuario básico no tiene memoria, así que no queda otra que abrir otra ventana para ver la correspondencia entre los chupinombres que la empresa asigna a sus categorías y los modelos reales. Y la información es parca: foto de catálogo y modelo de coche. Cuando me dicen que el modelo es un Kya Ceed me quedo exactamente igual que al principio. En las páginas de alquiler “viejunas” dan información sobre los vehículos que alquilan. Así, cuando necesito ir a un centro comercial o irme con tres amigotes a montar una exposición se si la capacidad del maletero será suficiente. Entre la mala experiencia de sufrir una página mal diseñada –si no permites que la reserva sea de menos de 60 minutos no dejes que el usuario elija ese intervalo de tiempo, procura que la información relevante esté siempre visible, no la escondas en tooltips y si usas un diseño responsive comprueba que realmente funciona en todos los anchos– y que no me apetecía ponerme a buscar catálogos de coches por internet, opté por usar una agencia de alquiler tradicional. El coste en dinero es superior pero todo el proceso fue rápido e indoloro así que, sumándolo todo, no hay tanta diferencia de coste. Seguro que alguna de las “pegas” se solucionarían en reservas posteriores, una vez conoces los modelos de coches. Pero lo de tener que hacer experimentos porque una empresa, joven y dinámica, no quiere o no sabe proporcionar al cliente toda la información que pueda necesitar en el momento en que la necesita me cuesta tiempo y dinero. Lo mismo que tener que sortear las idiosincracias de la web de reservas. Ahora estoy en la fase de encontrar la forma de darme de baja de la moderna empresa de alquiler. Pensada para gente joven y que sabe de coches. No soy el público objetivo: yo sólo quiero alquilar un coche, muy de tarde en tarde, sin pegarme con el proceso. Sometimes we tend to over-engineer our code. Just because we think it will look smarter, or run faster, or be more canon-compliant. Let’s take, for example, this function that gets a value from the server and translates it into a class name to apply to an element. it’s not the most elegant filter, but hey, it’s mine! As they say, devil will find code for idle hands to refactor. In this case, I decided, don’t ask me why, to change the switch for an array lookup. To make it less legible, mainly. To make any changes to the filter slightly difficult? Who knows. In any case, this was the second version. Despite my feeble attempts at AngularJS I know some things about JS. 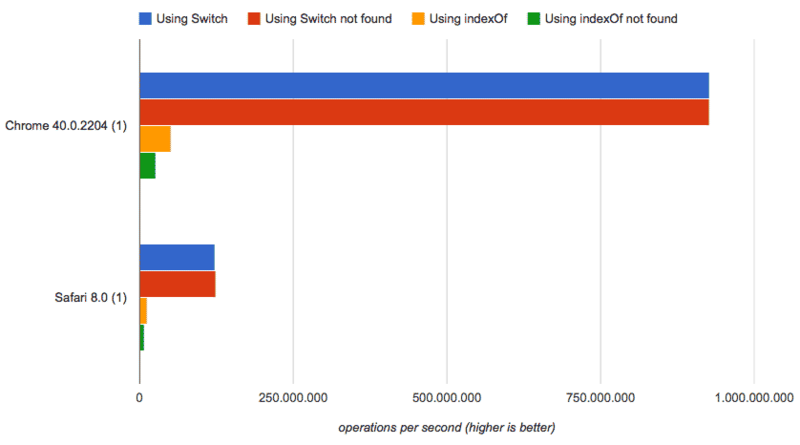 One of these things is that most of the array methods are not very optimized. So maybe it’s time to check which version is faster. Or less slow. Fortunately there’s an online tool that can help us to quickly solve this questions: jsperf.com. Using jsperf.com. you can create a set of tests that will be run in a loop for some time. The speed of the test will be determined by the number of loops executed in that time. Additionally you can run the same tests using different browsers in different platforms. This is specially useful when you’re optimizing your code for an hybrid app where you know the browser and the platform. And these are the tests, along with the results. 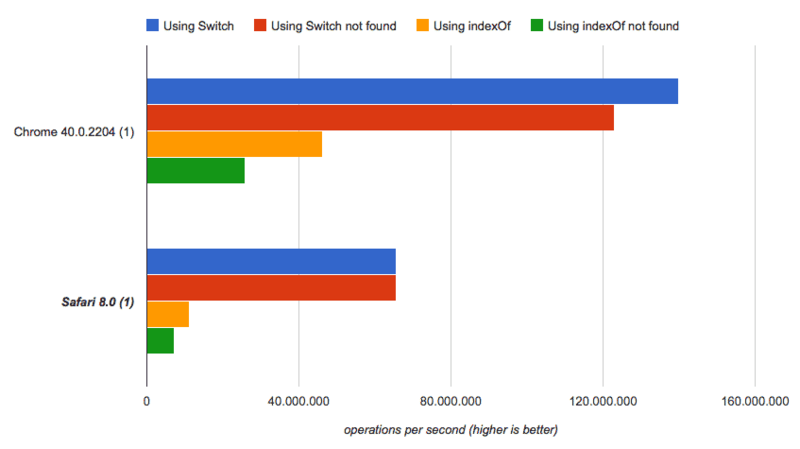 As you can see, the array lookup is way more slow than the old fashioned switch. Not surprises here, people. The only surprise can be the huge difference of performance between Chrome Canary and WebKit when you perform the same test in both browsers. Corollary: be careful when you start refactoring and always test the performance of your code. UPDATE: Vyacheslav Egorov, aka @mraleph, noticed this post and thankfully redirected me to this excellent presentation on how to avoid benchmarking pitfalls due to the JIT optimization. Basically “optimizer eats µbenchmarks for breakfast”. I’ve modified the first function to force the switch input NOT to be treated by the compiler as a constant, by changing it from switch(input) to switch(input.toString()). And here are the updated results. The difference is still there, both between browsers and ways to test for the string. But the number of iterations for each test shows that all (or most) of the code in each of my tests is being executed. Or so I hope. BTW, the benchmark is located here. Feel free to use and abuse it. So, the bottom line is: 1. don’t trust blindly in microbenchmarks, 2. don’t assume anything about the language and 3. run, don’t walk, to see mraleph’s presentation. A couple of weeks ago I was thinking about the relationship between AngularJS and this company that buys or starts projects and later sink them just because. No, no that company, the other one: Google. While perusing thru job boards AngularJS was appearing as a MUST in the same way (and intent) as .net appears for backend products. And then Google announced their real strategy. Now I’m gonna dive into prediction territory. Let’s not forget that the business of Google is not in the development tools but in the advertisement. Everything and everyone in the company works for the ads division, directly or not. And one of the hidden but huge costs behind it are the fees payed to Firefox and Apple so they put Google in their respective navigators search box. Chrome on the other hand, been a Google property, adds no cost beyond the engineering resources destined to code it. As well as the Chrome OS, and the Chrome Notebooks. On the other hand, we have another explanation for the switch to ATScript: the same way Apple has introduced Swift for iOS and MacOS development, maybe Google will introduce Dart (with AngularJS 2 to sweeten the deal) for Android (and Chrome OS) development. But this is just some wild fantasizing.